iPhones have evolved massively over the last few years. We now have a stunning edge-to-edge OLED display and a Notch with the exceptional Face ID in the iPhone X, but when it comes to the battery, it remains the same tech from 90’s that hasn’t changed much in recent times. With a mediocre 2710mAh battery, it can’t even last more than a day without being juiced up. Therefore, you need something extra that can keep your iPhone X juiced up throughout the day. Today we are here with Best iPhone X Battery Cases that you can buy. Let us see what all we have in our arsenal for you today so that it could be a perfect buying guide for you. This will surely help you pick out Best iPhone X Battery Cases. 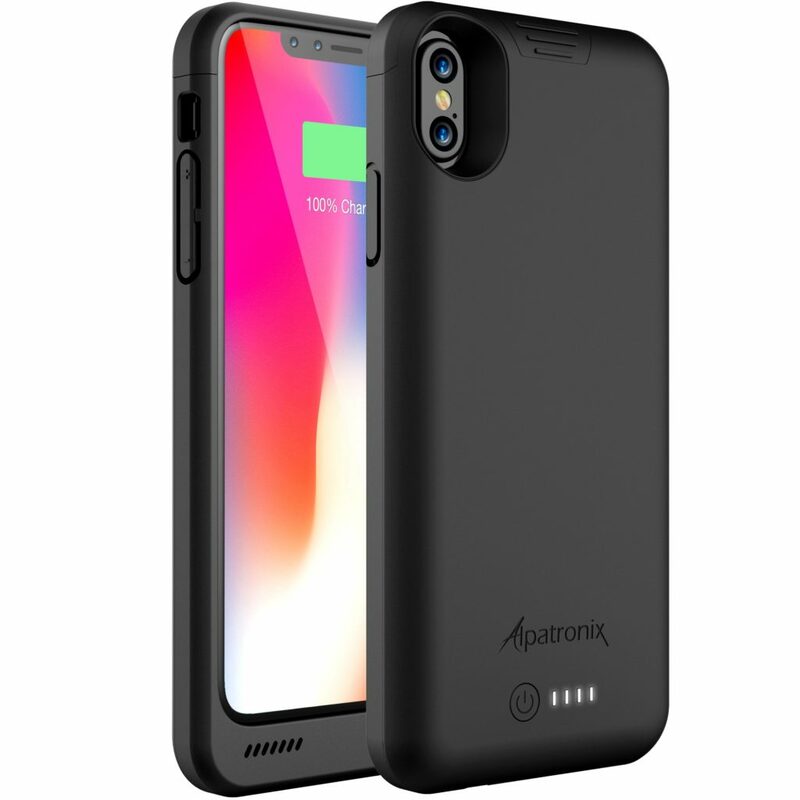 This BXX Slim Charging Case from Alpatronix is one of the most reliable and remarkably well-designed battery cases. It comes with a battery capacity of 4200mAh without adding much bulk to your device and weighs just 103grams. The case is certified by Apple and is reasonably easy to attach and remove due to the small removable top which allows your iPhone X to slide in perfectly. You can see the remaining charge through the four LED lights present on the back of the case. Interestingly, the case automatically shuts off after your iPhone X gets fully charged. The raised lip protection make the case extremely durable and safeguards your iPhone against accidental drops. The company has also included a scratch guard for display protection. The case gets proper openings for the speaker grill, and slots for dual cameras, power button and volume rockers. However, this case takes up the lightning port and hence it won’t support Lightning cable or traditional 3.5mm earphones, limiting its compatibility to Wireless headphones or Apple AirPods. You get a micro USB port on board for charging the case. Moreover, it supports Qi wireless charging, allowing you to charge the phone and case simultaneously. You can buy the Alpatronix BXX Slim Charging Case in black, gold and rose gold color options. 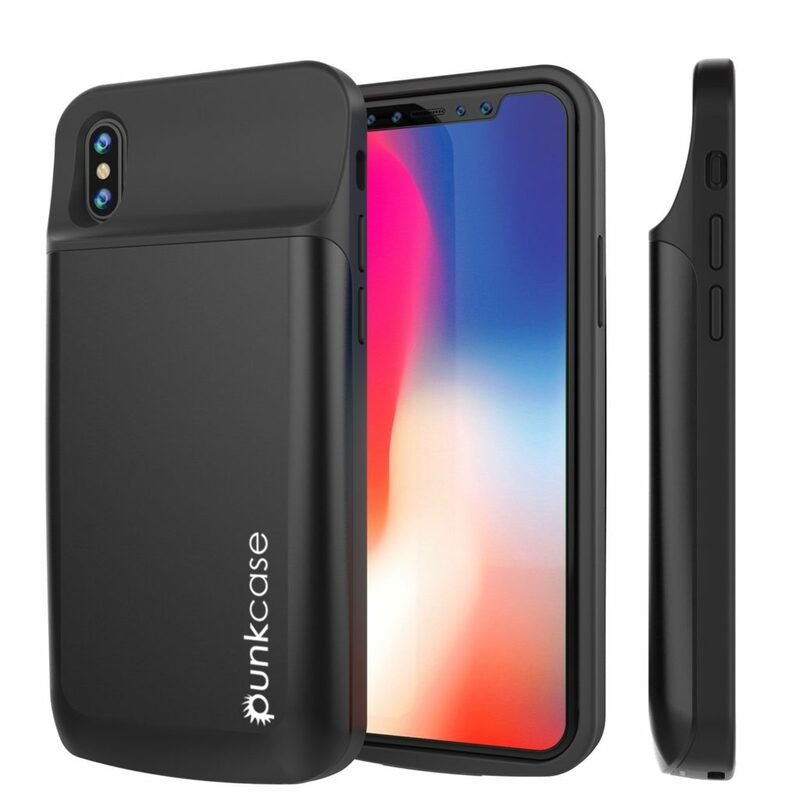 The Punkcase PunkJuice iPhone X Battery Case is a very good looking and well-built case which appears very different from a traditional battery pack. The partial top part of the case is flexible as the battery is stuffed below the camera module. This not only makes it easy for you to remove and apply the case but also helps in a better grip and weight distribution. The case body is made of a 360-degree dual-layered hard shell making it strong enough to handle accidental drops. The company also ships a screen protector for safeguarding the display of your iPhone X. The main highlight of this battery case is its large 5000mAh battery capacity which allows your iPhone X to stay alive even till the next day. Unlike the Alpatronix case above, this case utilizes its lightning port for charging, meaning you don’t have to carry a separate cable for charging the same. This battery case comes with a button to toggle charging and LED Lights on the bottom side which indicate the remaining charge level. It has precise casing and openings for the dual camera lenses, the dual speakers, the power button, the volume buttons, and the slider switch. The high battery capacity and the great design makes it one of the best iPhone X battery cases. The PunkJuice Waterproof Battery Case for iPhone X is one of the rare battery cases to sport IP68 rating for water and dust resistance. This allows you to take the benefit of your iPhone’s water resistance capabilities and use it underwater, as deep as 1.5 meters (4.9 feet) for as long as 30 minutes, without worrying about the case being damaged. However, the water resistance feature results in more bulkier and complicated design with more difficulty in application and removal of the same. The case is divided into two pieces and can be applied by placing your phone in the bottom half and affixing the top half part. Removing the case is very difficult as you need to dig your fingers into the top groove and pull. Despite having a bulkier design, the case packs only 3600mAh of battery capacity which will usually give more than a full charge to your iPhone. This too is equipped with the auto power cut feature to turn off charging once your iPhone X reaches the 100% mark. We have battery level indicator lights are present at the back. In addition to the necessary buttons and slots for the camera lenses, speakers, power and volume buttons, the case comes with a twistable knob for utilizing the slider button to switch between sound profiles. This is one of the best iPhone X battery cases for people who want a durable design with water and dust protection. This Battery Case from Feekea sticks onto your iPhone X just like the Moto Mods on supported Motorola smartphones. Given that, the major highlight of this case is its 2 in 1 detachable design. First part is just a protective casing which offers decent protection to your iPhone X without being too thick or bulky. The other part constitutes the main battery which can be attached magnetically to the existing casing whenever you need to charge your iPhone. This not only adds to the user convenience but also eases the process of application and removal. With that being said, just keep this battery pack charged and throw at your iPhone’s back whenever it needs to be juiced up. This case has a battery capacity of 5000mAh, making it enough for more than one full top ups. 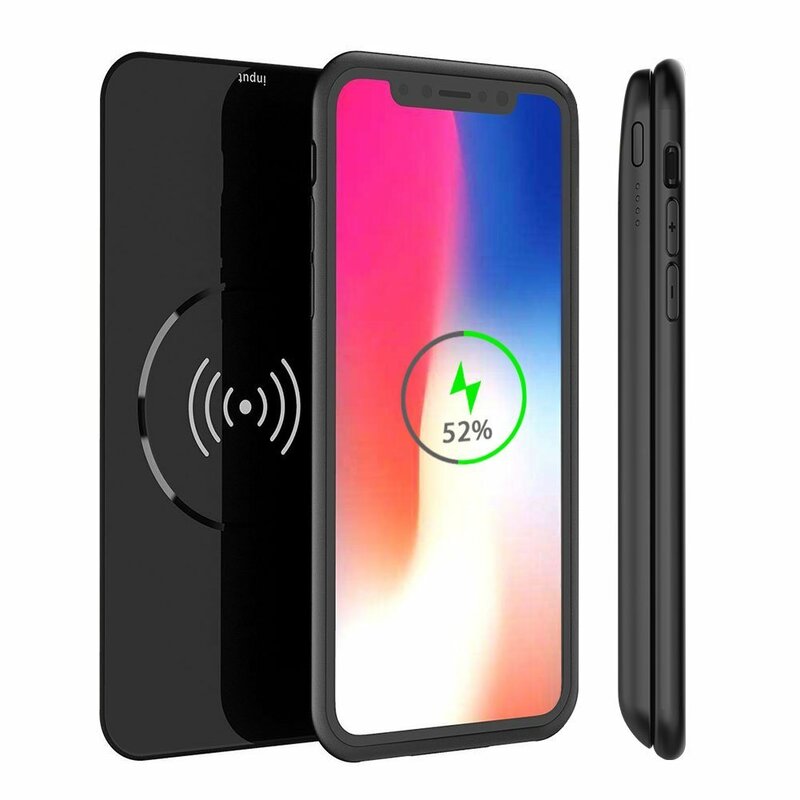 Basically, this case utilizes the Qi Charging capabilities of the device to charge it, indirectly portraying it as a portable wireless charger. The battery case is made with a hard shell aided by a TPU frame to provide shock resistance. However, don’t expect protection from this case that other battery packs would offer as you don’t get the raised lip protection which leaves your display at a risk of being scratched or damaged. Furthermore, this case also packs a kickstand at the back to let you enjoy media content while the device is kept on the flat surface. Before buying, do note that this case relies on the magnetic force for sticking to your phone which may betray you during rough usage and slid off the phone. 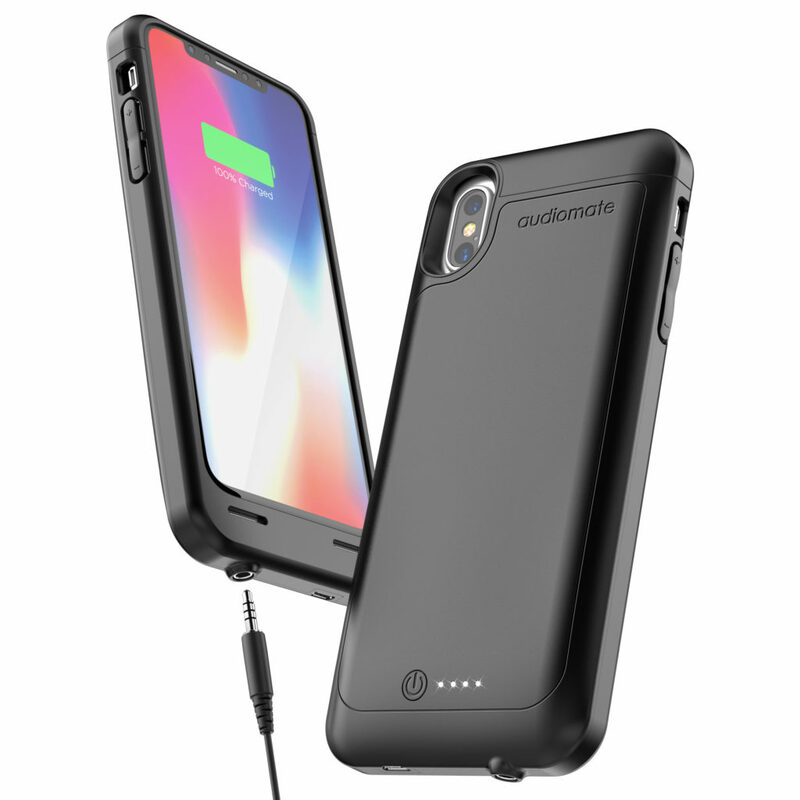 As evident with the name itself, the major highlight of this Encased AudioMod Battery Case for iPhone X is the presence of 3.5mm audio jack. Yeah, despite having the lightning port occupied by the battery case itself, it has an inbuilt splitter so that you don’t lose access to music via wired headphones. The best part is that you don’t have to use a dongle separately for that purpose. As an icing on the cake, the AudioMod even comes with a built-in DAC that adds to your headphone’s expertise. This case comes with a 4,600mAh battery capacity which is enough to charge your iPhone X for about 1.2 times, also, the company claims to add 36 hours of additional talk time with the case. Moreover, you can charge the case with the given Micro USB cable. This provides a good grip and is one of the most durable cases. There are four LED lights at the back to let you know whenever it needs to be juiced up, along with a power button to toggle charging. The slots for speakers and camera module are given accordingly. We also have an automatic turn off system which is marketed as Smart Power Reserve feature by Encased. This is probably the best iPhone X battery cases if you’re someone who wants extra battery but cannot compromise on the lack of lightning port. One can also buy this if he/she doesnt want to use an extra dongle for connecting the 3.5mm jack based earphones. Although, the above features add to the cost, making it one of the most expensive cases in our list of best iPhone X battery cases. So these were our top five handpicked choices for the list of best iPhone X battery cases that you can buy right now. We have made sure that we recommend you top rated and trusted things. For us, if you are an audio freak and can’t miss out on the headphone jack, buy the Encased AudioMod Battery Case or if you are worried about using your iPhone in water with the case, blindly go for the PunkJuice Waterproof Battery Case. Else, if you’re someone like me who just prefers a large battery capacity above all other features then the Feekea battery case is the way to go. Do tell us about your pick from the given list of best iPhone X battery cases.